For their eponymous album, see 1927 (album). 1927 are an Australian pop rock band formed in 1987 with James Barton on drums, Bill Frost on bass guitar, his brother Garry Frost on guitar and keyboards, and Eric Weideman on vocals, guitar and keyboards. They were popular in the late 1980s and early 1990s with their major hit songs "That's When I Think of You", "If I Could", "Compulsory Hero" and "Tell Me a Story". Their multi-platinum number-one album, ...ish (1988) was followed by The Other Side (1990) which peaked at number three. At the ARIA Music Awards of 1989 they won two categories: Breakthrough Artist – Album for ...ish and Breakthrough Artist – Single for "That's When I Think of You". At the 1990 ceremony they won Best Video for "Compulsory Hero", which was directed by Geoff Barter. Late in 1986 Garry Frost (ex-Moving Pictures) saw Weideman on a "Red Faces" talent segment of variety TV show Hey Hey It's Saturday, Frost offered Weideman a spot in a new band, 1927. In 1992 the group released a third studio album, 1927, which reached the top 40; but they disbanded the following year. Weideman reformed 1927 in 2009 with a new line-up. 1927 formed in Melbourne in 1987 as a pop rock band. In 1984 guitarist and keyboardist Garry Frost had left Sydney-based pop rockers, Moving Pictures, after their second album, Matinée. Frost had co-written Moving Pictures' 1981 number-one hit "What About Me?" – which was a number-one hit for Shannon Noll in 2004. In late 1986 Frost was writing songs at his home studio for an unformed band project. He was watching Nine Network's variety series Hey Hey It's Saturday's talent segment "Red Faces" when Eric Weideman appeared and performed a cover of The Police's hit single, "Roxanne". Garry drove from Sydney to Melbourne, about 880 km (550 mi), to recruit Weideman on lead vocals, guitar, and keyboards. Prior to joining 1927 Weideman had played in various cover bands including, Mixed Feelings, before starting a brief solo career. He later recalled, "I had only just started performing on my own. I was playing at a pub in Melbourne ... Then a friend of mine dared me to go on 'Red Faces'". The pair were joined by Garry's brother Bill Frost on bass guitar and James Barton on drums. The band's name, 1927, was drawn from a hat of suggestions and was from a favourite saying by Garry, "I haven't done that since 1927". After a year of seeking a recording contract, 1927 were signed by Charles Fisher for his label, Trafalgar Productions. With Fisher producing the group recorded their debut single, "That's When I Think of You", which entered the ARIA Singles Chart in September 1988 and peaked at No. 6. It is co-written by Garry Frost and Weideman. In 2011 former Hi-5 member, Nathan Foley, covered "That's When I Think of You" on his live album, Acoustic Rhythms. In October 1988 the band released their second single, "If I Could", which peaked at No. 4. It was co-produced by Fisher with Jim Bonneford, and was written by Garry Frost. In mid-November their debut album, ...ish, largely produced by Fisher (except "If I Could"), followed. Rock music historian, Ian McFarlane, described it as "brimful of stirring, stately pop rock anthems". It peaked at No. 1 on the ARIA Albums Chart for four weeks and stayed in the Top 50 for 46 weeks. It was awarded 5× platinum certification – for shipment of more than 350,000 copies. As of 2002, it was in the top 10 of the most successful debut albums by Australian artists. Two more top 20 singles from the album followed, "You'll Never Know" (January 1989) and "Compulsory Hero" (April). In 1989 "That's When I Think of You" was released internationally, it peaked in the Top 50 on the United Kingdom Singles Chart, and just reached the United States Billboard Hot 100. At the ARIA Music Awards of 1989, 1927 won 'Breakthrough Artist – Single' for "That's When I Think of You" and 'Breakthrough Artist – Album' for ...ish. At the 1990 ceremony they won 'Best Video' for "Compulsory Hero", which was directed by Geoff Barter. The band added Charlie Cole on keyboards (ex-Moving Pictures) and toured Australia in support of the album and associated singles. By late 1989, they started work for their second album when Garry Frost announced he was leaving the band early the following year. 1927's founder Garry Frost was replaced by Dave Dwyer on guitars and keyboards. They recorded The Other Side with Weideman as main songwriter, and Fisher and Garry producing. After leaving 1927, Garry Frost undertook songwriting and production work for other artists and worked on a solo album. The Other Side, which peaked at No. 3 in July 1990, provided a Top 20 hit with "Tell Me a Story". McFarlane described the album as "full of lush, ambitious arrangements and well-crafted pop, but it lacked the charm and rousing choruses" of ...Ish". Barton left in 1992 to be replaced on drums by Phillip Campbell, and in November they released their eponymous third album, 1927 produced by Mark Opitz. 1927 reached the Top 40 and the lead single, "Scars", reached the Top 50 but the second single, "It Ain't Love" (February 1993), was less successful. 1927 were suffering financial and internal problems and disbanded in 1993. In September 1996 a compilation album, The Very Best of 1927, was released, it included Weideman's debut solo single, "Nothing I Can Do", which peaked at No. 73 in Australia in 1997. Subsequently, Weideman performed as a solo artist. 1927 reformed periodically including for the Here and Now '80s revival tour in the early 2000s, Weideman also continued with his solo career performing in pubs. In September 2009 the group, 1927, re-issued ...ish as a digitally remastered edition featuring bonus live recordings of "Propaganda Machine" and "Compulsory Hero". The band, led by Weideman, reformed with Damien Cooper on drums, Craig Laird on lead guitar and backing vocals, and Simon Shapiro on bass guitar and backing vocals. On 17 June 2009 the band appeared on Mornings with Kerri-Anne and toured Australia during the latter half of the year into the start of 2010. In March they supported Simple Minds and followed in June with the second leg of the 20...ish Anniversary Tour. 1927 supported Roxette on their Charm School tour of Australia in early 2012. According to 1927's Facebook page, their fourth album, Generation-i, was due for release in April or May 2012. Pre-release copies of the album were available at Roxette shows which 1927 supported in February 2012. In June 1927 commenced their Generation-i Tour across the Australian east coast. McFarlane, Ian (1999). "Whammo Homepage". Encyclopedia of Australian Rock and Pop. St Leonards, NSW: Allen & Unwin. ISBN 1-86508-072-1. Archived from the original on 5 April 2004. Retrieved 22 June 2012. Note: Archived [on-line] copy has limited functionality. ^ a b c d e f g h i j k l McFarlane, '1927' entry. Archived from the original on 17 May 2004. Retrieved 22 June 2012. ^ a b Kruger, Debbie (July–August 2002). "They Wrote the Songs – Songwriters Discuss the Stories and Inspirations Behind Their Most Famous Songs". APRAP. Australasian Performing Right Association (APRA). Retrieved 26 June 2012. ^ Hung, Steffen. "Shannon Noll – 'What About Me'". Australian Charts Portal. Hung Medien (Steffen Hung). Retrieved 26 June 2012. ^ a b c d Swift, Brendan. "1927 > Biography". Allmusic. Rovi Corporation. Retrieved 22 June 2012. ^ a b c d Mengel, Noel (10 January 2004). "1927: What Happened Next". The Courier-Mail. News Limited (News Corporation). Archived from the original on 29 August 2009. Retrieved 23 June 2012. Note: for the second part of the article click on link. ^ a b Hamey, Sharyn (6 April 2010). "Interview: Erik Weideman". rockclub40. Retrieved 23 June 2012. Note: Weideman's first names are Eric Peter according to APRA, some other sources give the alternate spelling of Erik. ^ a b c d e Holmgren, Magnus. Magnus Holmgren, ed. "1927". Australian Rock Database (Passagen). Archived from the original on 6 December 2008. Retrieved 22 June 2012. ^ a b Braithwaite, Alyssa; Rose, Danny (18 September 2009). "Band 1927 to Live Again in 2009". ninemsn (Nine Entertainment Co., Microsoft). AAP (Australian Associated Press). Archived from the original on 18 April 2010. Retrieved 22 June 2012. Top 50 peaks: Hung, Steffen. "1927 Discography". Australian Charts Portal. Hung Medien (Steffen Hung). Archived from the original on 2 March 2012. Retrieved 22 June 2012. "To Love Me": "Response from ARIA re: chart inquiry, received 5 June 2015". Imgur.com. Retrieved 10 June 2015. "It Ain't Love": "Response from ARIA re: chart inquiry, received 24 May 2016". Imgur.com. Retrieved 30 August 2016. Generation-i: "The ARIA Report Issue #1226 – Week Commencing 26 August 2013" (PDF). 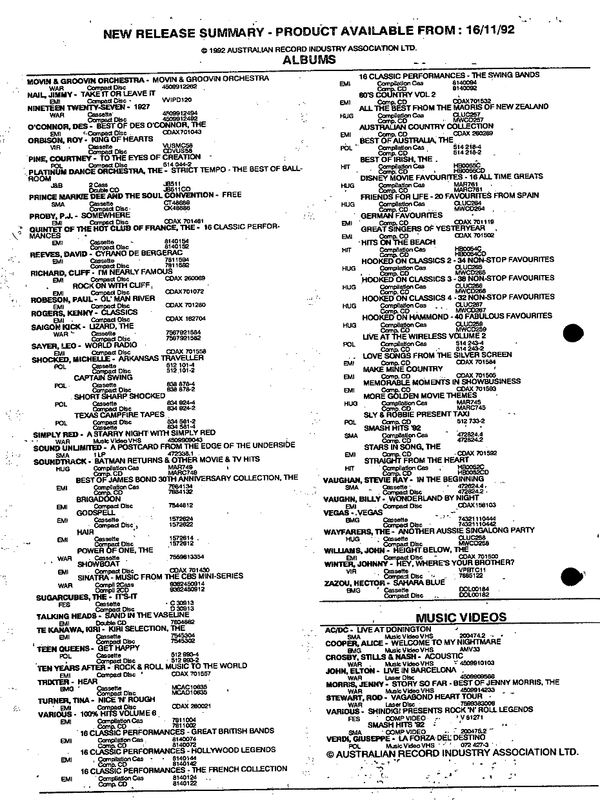 Pandora Archive (original document published by ARIA). Retrieved 30 August 2016. ^ a b "1927 – Album Info and Credits". 1927 Official Website (former). Archived from the original on 29 August 2009. Retrieved 24 June 2012. ^ a b ""That's When I Think of You" at APRA search engine". Australasian Performing Right Association (APRA). Retrieved 24 June 2012. ^ "Music – Acoustic Rhythms". iTunes. (Apple Inc.). 31 October 2011. Retrieved 24 June 2012. ^ ""If I Could" at APRA search engine". Australasian Performing Right Association (APRA). Retrieved 24 June 2012. ^ a b "Platterlog : LP & Tape – New Releases > 14 November 1988". Imgur.com (original document published by Platterlog). Retrieved 5 October 2017. 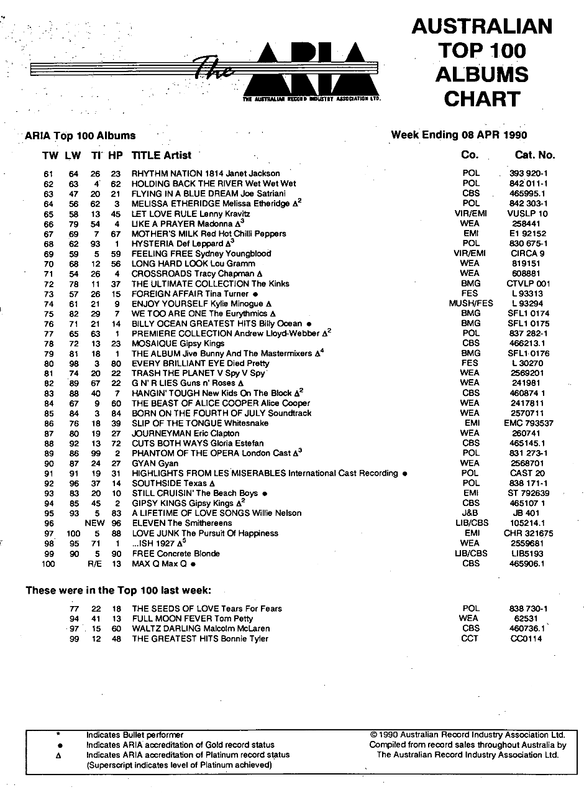 ^ a b "The ARIA Australian Top 100 Albums Chart – Week Ending 08 Apr 1990 (61–100) (from The ARIA Report Issue No. 13)". Imgur.com (original document published by ARIA). Retrieved 30 August 2016. ^ Nimmervoll, Ed (2002). "Chart Beat". Howlspace – The Living History of Our Music (Ed Nimmervoll). White Room Electronic Publishing Pty Ltd. Archived from the original on 29 January 2003. Retrieved 29 January 2014. ^ a b "1927". Official Charts Company. Retrieved 30 August 2016. ^ a b "Billboard > The Hot 100 > The Week of August 26, 1989". Billboard. Retrieved 30 August 2016. ^ "ARIA Awards – History: Winners by Year: 3rd Annual ARIA Awards". Australian Recording Industry Association (ARIA). Retrieved 22 June 2012. ^ "ARIA Awards – History: Winners by Year: 4th Annual ARIA Awards". Australian Recording Industry Association (ARIA). Retrieved 22 June 2012. 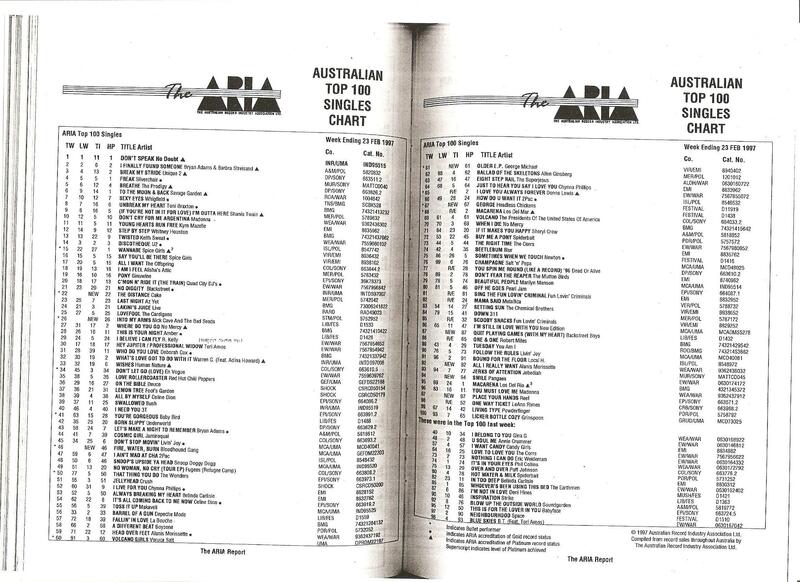 ^ "The ARIA Australian Top 100 Singles Chart – Week Ending 23 Feb 1997". Imgur.com (original document published by ARIA). Retrieved 28 April 2017. ^ "Well '27 Groovers the news you have all been waiting for!!!". 1927 Official Facebook. 10 February 2012. Retrieved 26 June 2012. Well '27 Groovers the news you have all been waiting for! The Brand New Album is finished... Generation-i will be officially released in April/May... And as a Thank you to our fans waiting patiently, There will be a limited number of limited edition pre releases available for purchase at the Roxette shows at the merch stand. Whoop! Whoop! Rock on Groovers! ^ "1927 & The Rembrandts Announce Generation-i Tour". BBM Newsletter. BBM Live. Archived from the original on 17 January 2013. Retrieved 26 June 2012. ^ "First brand new album in 21 years for 1927". Alberts Music. 21 June 2013. Retrieved 28 October 2013. ^ Hung, Steffen. "1927 Discography". New Zealand Charts Portal. Hung Medien (Steffen Hung). Retrieved 23 June 2012. ^ "ARIA Charts – End of Year Charts – Top 50 Albums 1989". Australian Recording Industry Association (ARIA). 1989. Retrieved 23 June 2012. 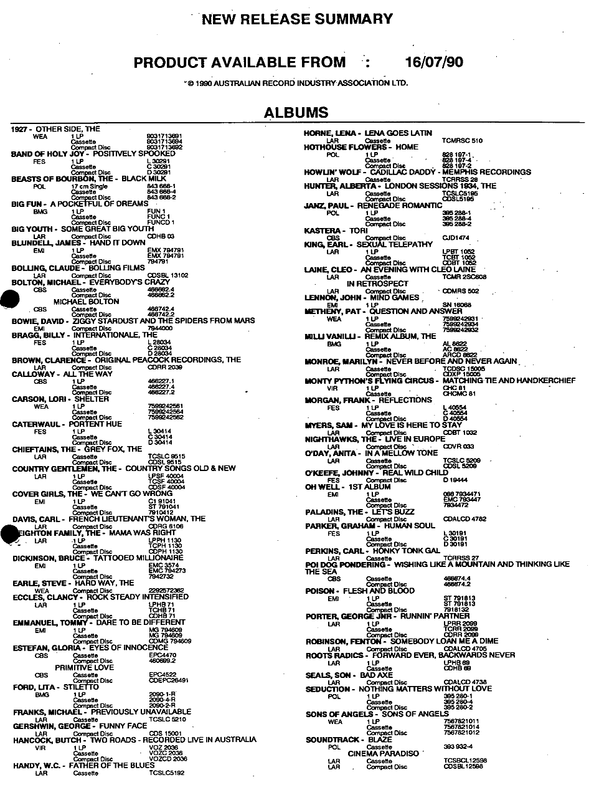 ^ "New Release Summary – Product Available from : 16/07/90 > Albums (from The ARIA Report Issue No. 27)". Imgur.com (original document published by ARIA). Retrieved 5 October 2017. 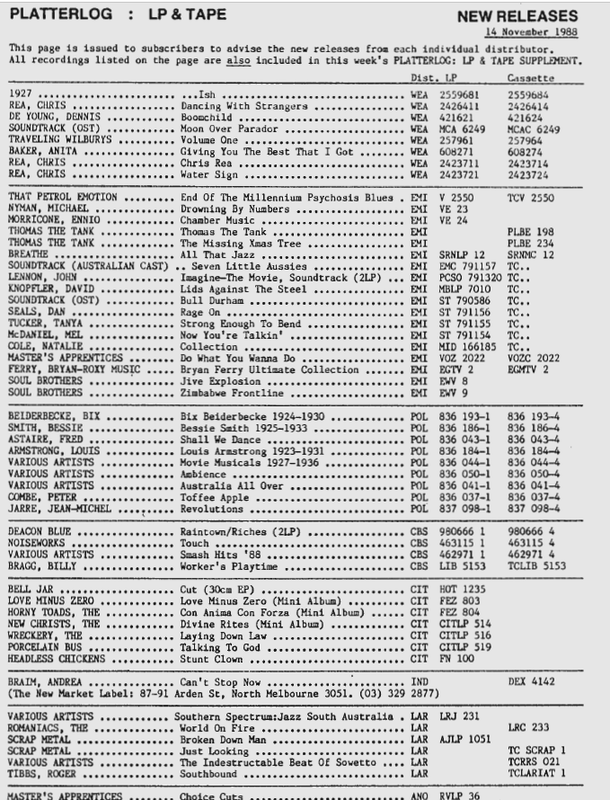 ^ "ARIA Charts – End of Year Charts – Top 50 Albums 1990". Australian Recording Industry Association (ARIA). 1989. Retrieved 23 June 2012. ^ "New Release Summary – Product Available from: 16/11/92 (from The ARIA Report Issue No. 146)". Imgur.com (original document published by ARIA). Retrieved 5 October 2017.